New Media Video News blogs without podcast feeds: Damn them to Hell? I was going to damn Beet TV’s Andy Plesser to Hell for (as of today) still not offering a video podcast feed, as if anyone still cares about FireAnt anymore with the plethora of rss video aggregating channels out there with embed options. I don’t want to have to download anything to watch video! Sheesh! I would like to watch video feeds from Fast Company, Adult Swim, Democracy Now!, Wired, AND Beet TV – switching between them all with ease – and then if I feel like it, getting them all on my ipod. I can do this with all – save Beet TV. Why Andy, why? Why do you continue to force me to visit your page to watch video when most other sources provided mobile options? I am a part of the Me generation, and us Me’s like to have it OUR way. NOW. Most of the innovators behind the new media revolution are young and plugged in. We are connected, interfacing with people through several mediums all day and night, and we are not timid to question/complain when we are not being served properly. ..But I hate the idea of permanently damning someone anywhere, even if it’s just a page on a website. Aw, when did I become a nice girl? 1. Redman Live Freestyle – Jayson was listening to this at his desk this morning and I was loving it! Greatest Hip-Hop Groups: The Postgame – Watch Run-DMC’s Run and Public Enemy’s Chuck D chop it up about the greatest hip-hop groups. 4. Pixelodeon is happening in Los Angeles June 9th & 10th! …I predict that The Host is going to be the best horror film of the year. t’s also notable that it’s a Korean film, and their film industry is only now getting major international attention. I think that what Crouching Tiger did to bring Chinese cinema to the mainstream, The Host will do for Korean cinema. So, besides the other 2 million media related things I involve myself with, I am also a columnist for Urban Latino Magazine. ..Although I find it to be an interesting read, their website is poo, but don’t blame me because I didn’t design it! Last month I profiled new media guru Jose Castillo for the first installment of my Latinos in Tech column (that I wish I could link to, but can’t because of Urban Latino’s very un-web 2.0 site!!!). 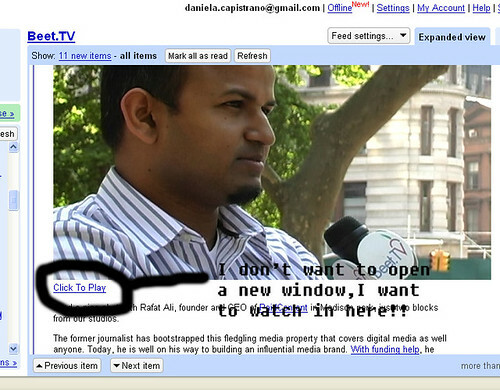 I “found” Jose through one of my favorite sites, Beet TV, where he was featured speaker on online video trends. Jose is going to be at PodcampNYC and I think I’m going to go too, just to hang out with him in person and fill my head with lots of podcasty goodness. … I keep reading everywhere that the “big news” is that MTV is going to start allowing viewers to grab video. This has been in the works forever so it’s not really big news to me. Comedy Central already lets you embed their clips, so I will be excited (I guess) when all channels/divisions including MTV News have the ability to do this. … But in a way it’s kind of like trying to get excited about, let’s say, gaining the ability to draw a circle. It’s good that it will happen, but it’s sooooooooooooooooooooooooooooooooooooooooooooo about time. geez. In any case, right now you can get around not being able to download MTV News content in Overdrive by subscribing to our video podcasts. I have seen many of our podcast files in youtube, which means some of the smarties in our audience are doing their part to share what they like.